The flautist has studied Indian classical music under master musicians in Varanasi, India over the last 20 years. 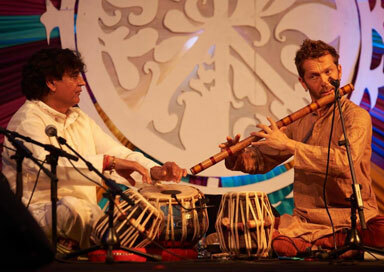 He specialises in Bansuri (Indian classical flute) but is also trained as a tabla player. His focus is on the sublime aspects of music, being rooted in Indian classical music (a tradition of improvisation) he has realised his gifts and abilities in innovating new ways for music to translate through other artistic modalities and has worked extensively with dance, yoga and also theatre. He crosses many other genre including jazz, drum n bass, world fusion and electronica, and has performed at world class venues including; The Place, London, Sadlers Wells, The UN headquarters, Macba in Barcelona and many more. He can booked for weddings and events with a tabla player.